Power can be this flexible! 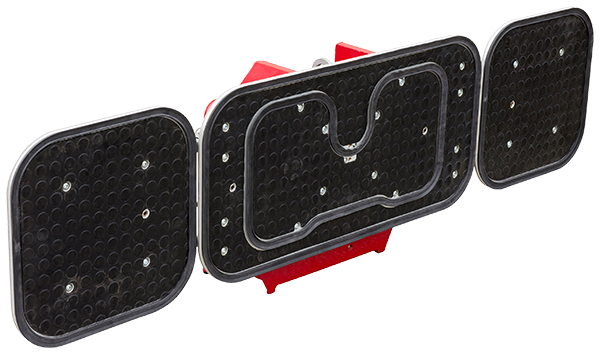 Our minicranes are able to get anywhere due to the compact design, but still have tons of lifting capacity. Astonishing! Ease of use; we get that! Then please contact us. Be sure to ask for the most recent information and price list! We will make sure you get the information you need. In the past, construction workers lifted heavy loads at the job site themselves. Large windows, heavy beams, the list goes on. But those times are gone. We know how damaging heavy lifting is as we age. Working condition regulations no longer allow it either. With good reason! But what do we do in tight spaces that a crane can't reach? Of course there is the chainfall, but their use is time-consuming and leads to frustration. The result is that workers often do it anyway: carry that heavy object inside just this once. There is no need! 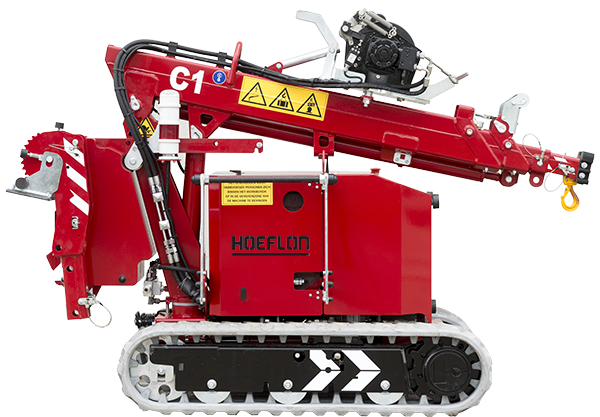 Why buy a Hoeflon mini-crane? 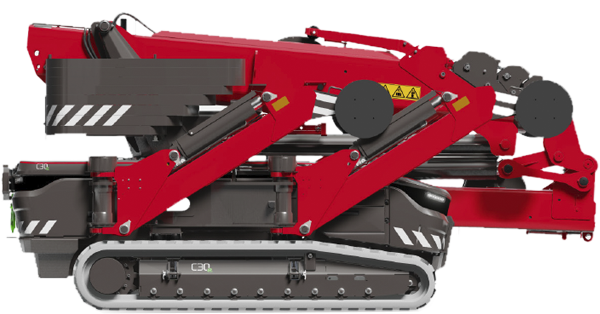 Our mini-cranes on crawler tracks make that heavy lifting a thing of the past once and for all. Keep your workers healthy: afford them the convenience of a Hoeflon. You will more than recover the investment through fewer employee injuries and less lost time. 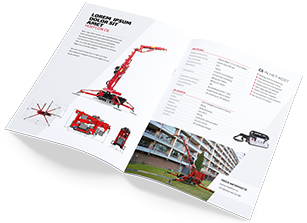 The fastest mini-crane stands 20 metres tall within 3 minutes. Ready for hoisting in no time! 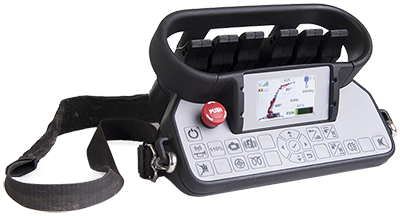 Among all the multifunctional cranes, our controls are simplest. Rental companies that want to rent cranes without an operator are among our most loyal customers. What’s more, all the mini-cranes, with the exception of the C10, can be transported on a trailer. The C1 even fits in a cargo van and passenger lift. Machines with IQ; that’ll be clear when you start using them. 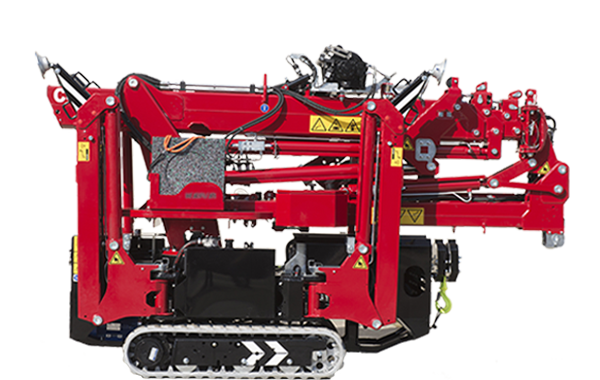 Intelligent cranes that you can start using straight away, without making any settings. This allows you can focus on the hoisting job rather than the crane configuration. 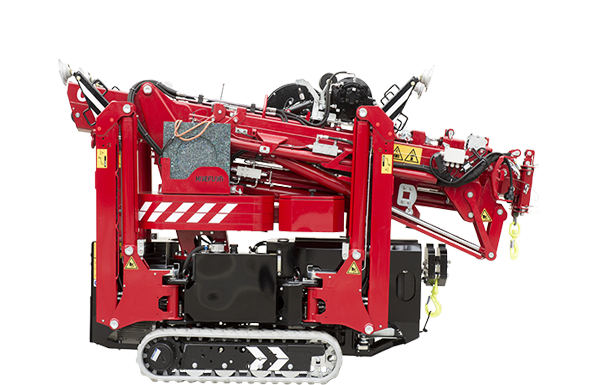 The safety features built into our cranes don’t get in your way; they make your job easier. Load value, boom angles and lengths are all shown on the display of the remote control. 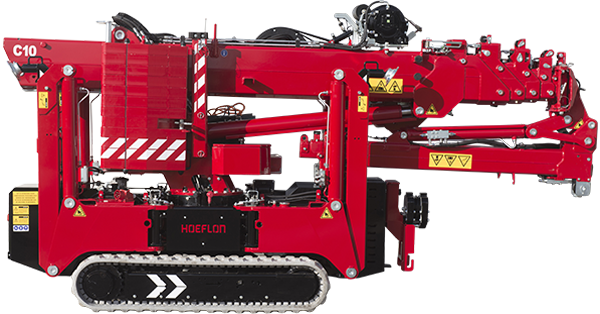 Hoeflon machines are fully operable from the remote control, including driving and the levelling jacks.